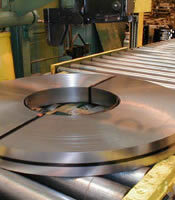 Our single-purpose facility is specifically designed to warehouse and slit steel. As a result, upon receipt of your master coils, we typically can move steel through the slitting process in 48 hours or less, and often even faster for rush orders. Our tenured service center account executives stand ready to answer questions, expedite service, and provide ongoing account management. YOUR steel is ALWAYS our highest priority. Your order will never be bumped for steel that we own, because we don’t sell steel—we only slit customer-owned steel. That means fast, reliable and responsive service—every time. 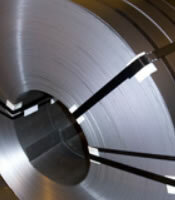 Coil Slitting: We slit your carbon and stainless steel to your exact requirements. 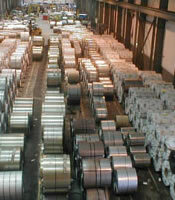 Material Handling: Your steel is moved efficiently through our facility for fast and efficient turnaround. Warehousing & storage: Not ready to have your steel slit yet? 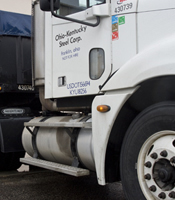 Let Ohio-Kentucky Steel hold it in inventory until you need it. Delivery: Need quick turnaround? Your steel is delivered just-in-time to meet your manufacturing schedules. (c) 2008 Ohio-Kentucky Steel, LLC. All Rights Reserved.